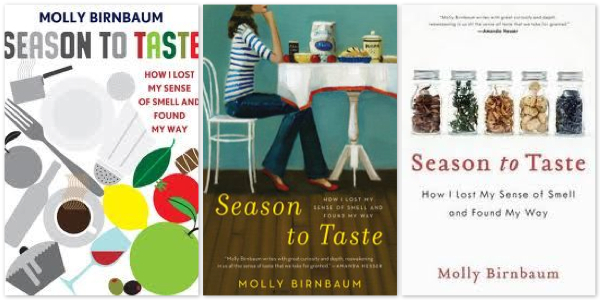 The book for this month’s On My Shelf and Kitchen Reader post is Season to Taste: How I Lost My Sense of Smell and Found My Way by Molly Birnbaum (this month is was my pick!). 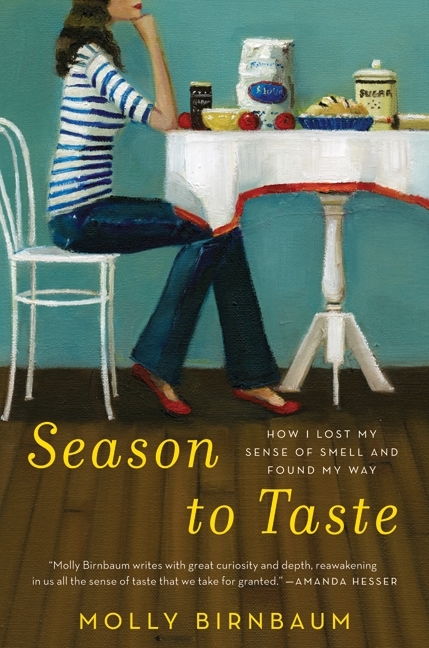 As you may guess from the title, this is not your typical culinary memoir. Food is at the core of the story, but Birnbaum isn’t here to tell us how backbreaking being a chef is, or recount her adventures eating around the world (although you get the sense that, had things turned out differently, that may have been the book she’d written). Although she is working as a restaurant dishwasher and about to begin culinary school when the book begins, that all changes when she is hit by a car and loses her sense of smell. The book is in essence a journey of Birnbaum’s recovery, and her refusal to accept doctors’ prognoses that she will never smell again. After recuperating physically, Birnbaum tackles her emotional scars by delving into the science of smell. 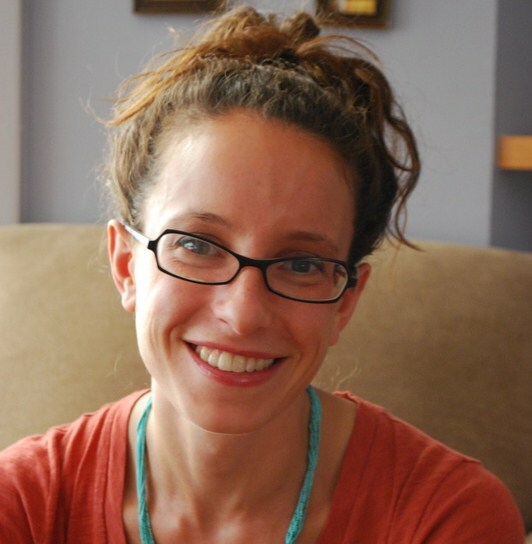 She interviews and references scientists and neurologists, perfume makers and flavor inventors, chefs and writers to get to the bottom of her condition and learn what she can. It’s a fascinating read that is nicely written and full of fun facts. Did you know, for example, that Ben of Ben & Jerry’s doesn’t have a sense of smell (known as anosmia)?! That’s why their ice cream has so much texture (read a great interview with them here from Not Quite Nigella). There are a lot of things that I love about this book. While it’s all about the absence of smell, Birnbaum fills her prose with original but spot-on descriptions of scents. As she slowly begins to regain a few odors here and there, New York takes on a whole new layer: “The park carried a twang of smoke, whiffs of tree and flower, the murky metallic ooze of a water fountain, drifting coal and grill, roasted nuts. The streets were filled with surprises – hot dogs! coffee beans! – and the taxicabs called to me with their old leather, new cigarettes, and remnants of Chanel No. 5, the signature, powdery aldehyde of whomever just held my seat” (p. 127). I also enjoyed the science-heavy parts more than I thought I might, in the same way that I can speed through an Oliver Sachs book of stories on neurology (I was happy when he made a few appearances in the book, although surprised that he didn’t have more to add). There were also things about the book that I loved, well, less. Towards the beginning Birnbaum includes a section on three months she spent in “Africa” during college. She was in Namibia, but except for one instance insists on calling it Africa. Pet peeve aside, I found this part to be irrelevant to the larger story and thought that it seemed to be there more to tell us she’d been. I also can’t decide how I feel about the narrative structure. She jumps back and forth between her personal life (moving to Park Slope, applying for jobs, getting a boyfriend) and the science of smell. This works better at the beginning when the two are highly intertwined, but as the book progresses the narrative feels increasingly disconnected. You get the sense that she unearthed more information than was really necessary or appropriate for this genre of book but did her best to stuff it all in anyway (an urge I can totally relate to, but which meant that she lost me a bit by the end). All that said, you should read this book. Seriously, can you imagine losing your sense of smell? I don’t think any of us who have it realize, or take the time to appreciate, the immense role that smell plays on our daily lives. Smell triggers memories, tells us when milk has gone bad, and gives us major hints about how food is supposed to taste. I want my husband who is in med school to read this book, as well as one of my best friends who has congenital asnomia, meaning she was born without a sense of smell. But even more so I think it’s important for people without an obvious connection to smell to read it and think about all that we experience through our noses. The Kitchen Reader is a food-related book club that has been going strong since 2009. If you would like to learn more or join, click here. To see other members’ reviews of Season to Taste, click here. This sounds like a seriously intriguing read! A great combination of my love of food and my passion for science. Thanks for sharing! Thanks, Katherine, for picking such an interesting book this month! (Did you know that this month the Kitchen Reader had the most reviews ever published? 16!) I have certainly gained a new appreciation for my nose and I hope I never lose my sense of smell. It’s amazing how much information we gain from it. For anyone who likes eat losing one’s sense of smell is a tragedy – really. Sounds like an interesting read. It also sounds like she — and perhaps her publisher — weren’t sure whether this is a personal life story type book or more a science book illustrated with her personal experiences. The inclusion of her Namibian experience is a good example: perhaps relevant to the first type of book, definitely not to the second. Given the subject matter, I really think the second type of book might be more appropriate. Thanks for an excellent review. I can’t imagine how the life is when looses the sense of smell. this book seems quite interesting with the author’s journey towards the sense of taste. Good Pick,indeed! I have a friend who was born without a sense of smell, and I wonder constantly how that has affected his life over the years. I cannot imagine not being able to smell, but since he was born that way he says its not a big deal because he’s never had to actually miss it. Anyway, this would be an interesting read from the point of view of someone that had a sense of smell and then lost it. I imagine it would be devastating. This sounds like a good read. The book sounds interesting. I can’t imagine losing my sense of smell. I loved that little tidbit about Ben and Jerry’s though. I’m so obsessed with the texture of food already, that might put me over the top into crazy-ville. I think I heard something about that story on one of the food channels. Interesting story and I am sure the book provides more insight. Great review! Thank you for the recommendation and book choice! Thank you so much for the book review, it sure sounds very interesting…and so intriguing. So excited about someone else doing food literature reviews! This is actually a book I’ve wanted to read, and your review means I will be picking it up soon. We take a lot of things for granted and it’s nice to read a story like this. Thank you for the review and letting us know about this wonderful book! Thanks for the recommendation. It sounds like a fascinating book. I have an aunt who has lost her sense of smell in an accident and unfortunately she has never fully recovered (her smell and taste are limited still). Thank you for selecting this book! I’m not sure I would have picked it up otherwise, but found it to be enjoyable – I especially enjoyed Molly’s use of adjectives. Thanks for picking such a fascinating book! It’s something I never would have read on my own, but definitely enjoyed. I learned so much! Thanks, too, for sharing info about celebrating vegetarian Passover on Twitter! It’s much appreciated.